In his first public meeting since returning from Kailash Mansarovar Yatra, Congress president Rahul Gandhi accused the government led by Prime Minister Narendra Modi of dividing the people of the nation and declared that a united opposition will defeat the BJP in 2019 Lok Sabha elections. Addressing protesters at Ramlila grounds, Gandhi also raised questions on the rising fuel prices, the issue of demonetisation, farmer suicides, unemployment and the Rafale jet deal. “Narendra Modi used to say that nothing has happened in 70 years and we will do that in four years. It is true, what he has done in four years has not happened in 70 years. Wherever you see, one Indian is fighting another. Wherever you go, they divide people – one religion with another, one caste with another and one state pitted against the other,” he said. “The rupee has never been so weak in 70 years, petrol today is over Rs 80 while diesel is touching Rs 80. Modi while in opposition used to clamour about price rise but today he is silent,” he said. The Congress chief said that the PM has maintained a stoic silence even as farmers commit suicide in the country and women are facing atrocities allegedly at the hands of BJP MLAs. Gandhi said that while farmers, workers and small traders were losing hope, the biggest “15-20 crony capitalists” were enjoying all the perks. “When questions are raised in Parliament about the Rafale (jet) deal, the Prime Minister is unable to give answers,” said Gandhi. Leading the Bharat Bandh protest call given by his party, Gandhi marched from Rajghat to Ramlila grounds. He was joined by leaders of various opposition parties which have extended their support to the nationwide shutdown call. Thousands of supporters gathered at the protest venue in support of the bandh call. 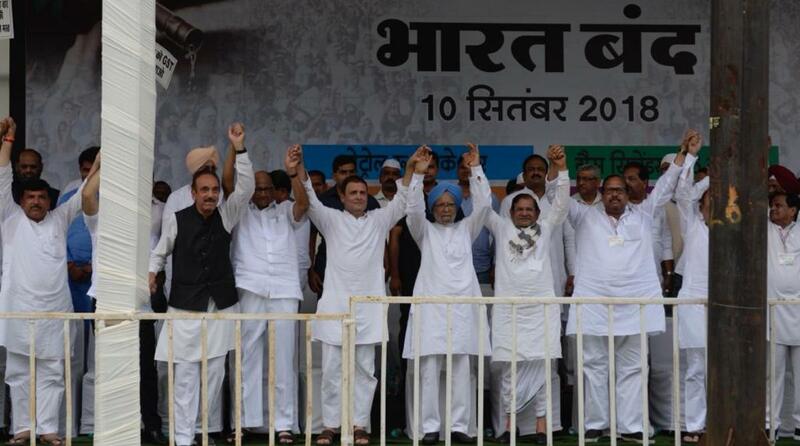 UPA chairperson Sonia Gandhi, Nationalist Congress Party’s Sharad Pawar, Loktantrik Janata Dal’s Sharad Yadav and former Prime Minister Manmohan Singh were seen with Gandhi at the protest rally. 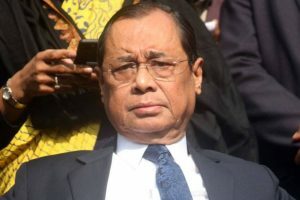 The 48-year-old Congress chief expressed confidence that shared concerns of the united opposition is a sign that the BJP will fail in the upcoming general elections. He said that while the opposition leaders are concerned about the burning issues, the BJP appears unperturbed. “This is the difference between them and us. We promise from here that we will work together to remove the BJP,” he said. Joining the call for a united opposition given by his party chief, Manmohan Singh said that the situation in the country has “gone beyond control”. “Circumstances show that the situation has gone beyond control now. Farmers, businessmen, youth are facing crises in their respective fields. The government has failed miserably in fulfilling the promises made to common people. The time has come to change the party in the Centre and this will happen very soon,” he said. Singh, who served as Prime Minister of India for two consecutive terms from 2004 to 2014, urged the opposition parties to shed their differences and unite to preserve the secular identity of India.